Heart Wrenching Message From Team Hope For Prasha : Looking For A Miracle ! Prasha’s life changed when she was only 23 years old. At that time, she was a normal third-year student at the Polytechnic Institute of NYU, working towards a degree in Mechanical engineering, who had her whole life ahead of herself. Then, tragedy struck. That year, she lost her closest cousin to a motorcycle accident. Due to the trauma, she had a seizure. 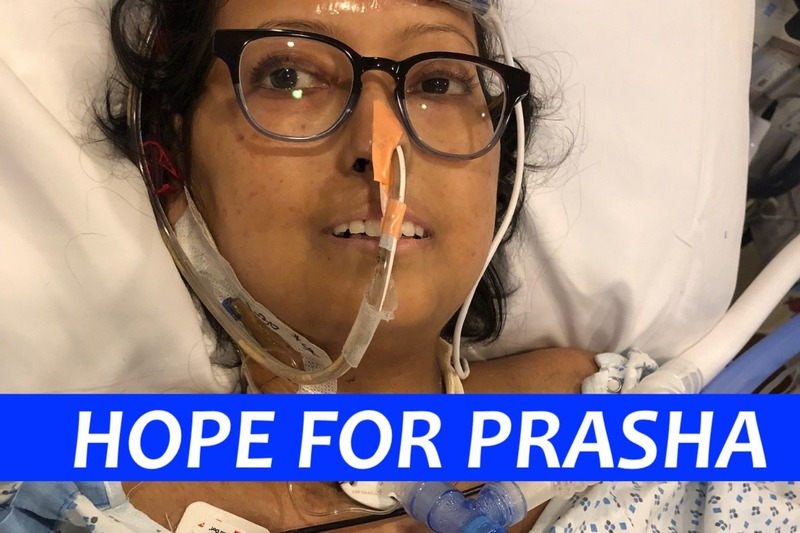 The ensuing hospital visit led to even more bad news: Prasha was diagnosed with scleroderma, an autoimmune rheumatic disease targeting connective tissues. Scleroderma hardened her arms and hands until they became scaly. It tightened her skin until her fingers curled like bony, immovable claws. It caused her intense joint pain from her arms to her legs. Her doctors saddled her with a bleak outlook, telling her she would probably never lead a normal life. It would be filled with doctors’ appointments, treatments, medication, and pain. Also, they told her, she would never have kids, which was a devastating blow to her spirit. After the initial shock and dismay passed, Prasha’s inner fortitude shone through. She decided to enjoy her life to the best of her ability. She made a bucket list. She traveled. She visited old friends and made new ones. Those experiences made her happier and were a reprieve from her daily medical horror. She met her husband, Dipak, a wonderful guy supported through her sickness. Miraculously, she got pregnant. Prasha’s pregnancy was one of the most complicated pregnancies. She was told to terminate even at the fifth month due to the risk to the mother’s body. Yet, she persevered. Jolene was born after seven months of gestation, a premie but healthy. However, their happy story ended on a bitter note when her lungs failed the very next day. Prasha flatlined; she was on the precipice of death. She said she felt so close that she didn’t feel any pain. Fortunately, her doctors were able to rescue her. Her rescue wasn’t a panacea, though. In October 2013, she was diagnosed with Pulmonary Fibrosis. The scleroderma had spread to her lungs, leading to Pulmonary Fibrosis. Pulmonary Fibrosis is when your lungs tissue change into scar tissue, making each breath difficult. She was put on oxygen and given a 2-5 year prognosis. Her only hope for a full recovery was a double lung transplant. She was rejected twice due to the severity of her scleroderma. In February 2014, she was diagnosed with pulmonary arterial hypertension where even with supplementary oxygen, her body was not getting sufficient oxygen. Hope waned, but she did not give up. Finally, in December 2014, she was listed for a double lungs transplant. Then, it was a waiting game – going to the doctor’s appointments, therapies, avoiding sickness until the call came. The wait was difficult. There were many restrictions on her life. She lost her independence; always hooked up to a green oxygen tank always and a hovering aide, nearby. She lost a toe to gangrene. But she did not lose hope. After more than a year on the waitlist, on February 9th, 2016, Prasha received her gift of life – her double lung transplant. The surgery was a success. We are forever thankful to Melissa (the name that Prasha gave for her donor) and her family. Meanwhile, after three months of recovery, she left the hospital and returned home in April 2016. Prasha cherished every moment of her new life, vowing to make good use of the precious miracle she had been granted. First, she became stronger. She was punctual about her doctors’ appointments and followed their advice. She meticulously organized her plethora of medication. She regularly attended pulmonary rehab to strengthen her lungs. Her first-year post-transplant was dedicated to her health. Then, making good on her promise to not waste her new lungs, Prasha continued her work as an organ donation advocate and a community leader for those affected by scleroderma and pulmonary fibrosis and hypertension. Prior and post-transplant, she volunteered for organ donation and has been involved in fundraising events. She is committed to making her voice heard about pulmonary fibrosis, scleroderma and many more. She went to Capitol Hill in 2018 with her husband to meet with New York State representatives to raise awareness and fundraising for this disease. More recently, she has spoken at various seminars, sharing her incredible life journey and inspiring those who are similarly affected. These last three year after transplant, Prasha has been very active and productive, advocating for what she always believed in. Click here to support her. Her new lungs also gave her the opportunity to be a mother to her beloved five-year-old, Jolene, a loving and supporting wife to Dipak, and a sister and a daughter to her family. Through her dedication to raising awareness, Prasha’s efforts are not only known to her family, but also to the larger community. She is known as a lung warrior, fighter and community advocate. We want to thank everyone following her journey and supporting her for the past couple of years. We were very excited to celebrate her third anniversary this year. Unfortunately, on December 16th, 2018, Prasha was hospitalized due to a high fever after her monthly IVIG treatment. She has been admitted to the New York Presbyterian Medical Intensive care unit (ICU) where she has been given treatment for rejection, infections and several other complications for the last 7 weeks. She is currently on ECMO, ventilator and dialysis machine. Her lungs and kidney are deteriorating. The scarring in her lungs has returned. Prasha’s best chance at recovery is a second lung transplant as well as a kidney transplant. We are working hard to relist her. We need your support to help Prasha stand on her own again. The last time, it was only with your help that Prasha was able to fight for her life. We are very grateful to the medical team at NYP as they have constantly provided Prasha with best care and support. We believe she can make it again. Her spirit is still strong. We would like your support for listing Prasha for a second lung transplant and kidney transplant. We still have HOPE FOR PRASHA and for Jolene to see her mother. We love her and hope you could join us to make her next chapter possible.